The battle against hair fall continues! No surprises here. Because when the seasons change, my hair tend to go into a frenzy. Only a couple of months back, I reviewed L’Oreal Professionnel Density Advanced Shampoo for my hair fall issue. And now with NoorSecrets Natural Herbal Hair Oil for review today, I thought I could fight a good fight with these two great hair loss products put to use together! While, L’Oreal Density Advanced Shampoo really worked wonders in making my thinning hair appear thicker & denser, it couldn’t do anything in hair fall department. So, in comes the NoorSecrets Natural Herbal Hair Oil for hair loss with the logic that since oil penetrates deeper and stays on your scalp for longer, an anti-hair fall oil is always better than an anti-hair loss shampoo. Claims: Prevents hair loss for men and women with its therapeutic, healing properties. Stops hair fall, controls dandruff, promotes hair growth, reduces stress and prevents premature graying of hair. Packaging: The oil comes packaged in a very simple white opaque plastic bottle contained in a cardboard box. While, the packaging is sturdy and convenient to use, it could have been made more attractive. Looking at the packaging the price INR 999 seems to be too high! Consistency: The oil is dark green in color and has a runny consistency that looks, feels and somewhat smells like fenugreek juice! Scent: The scent of this oil is purely natural and herbal. From the strong, herbaceous-medicinal scent it seems that no artificial fragrance or perfume is added to it, which is a good point according to me. 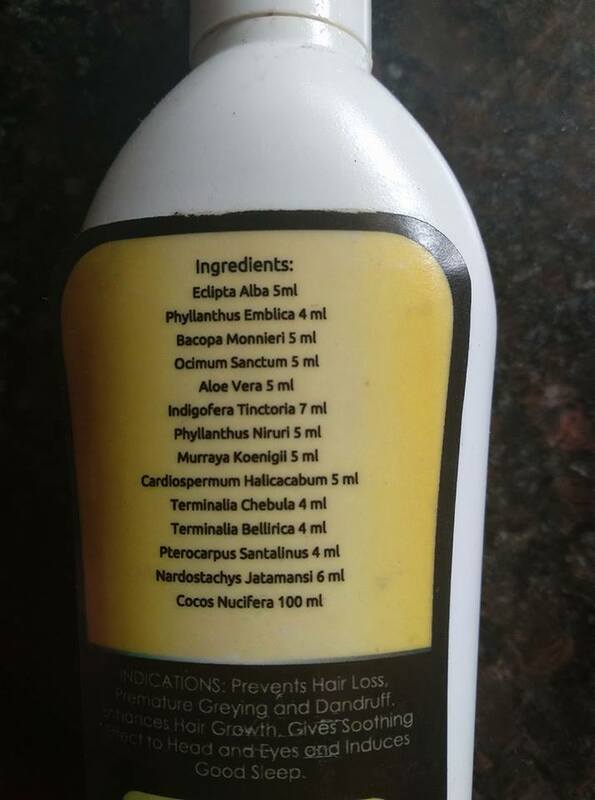 Hair fall control: I oil my hair weekly, so to say I have tested this oil for over a month means I have used this oil for 5-6 times now, which is a good enough time for a product to at least show some improvement if not the complete change. But I’m sorry to state here that the oil has not been able to help much in controlling my severe hair fall! Since, my hair fall is due to a medical issue, which I have mentioned earlier also in one of my previous posts, I feel the oil with its proven natural ingredients should help someone suffering from moderate hair fall. Stimulates hair growth: As hair regrowth tend to come only after hair fall control, I cannot comment on the regrowth claim. I have not noticed any new growth in my existing hair. Prevents premature graying of hair: Since, premature graying is not an issue with me and I have not noticed any premature graying of my hair, I cannot comment on this aspect as well. Controls dandruff: Yes, yes, yes! Before using this oil, I had some really bad scales and flakes of dandruff all over my scalp. And now after this oil for a month, I must say that my scalp is clean and free from any dandruff. So if you have dandruff, or troubled by hair loss caused due to dandruff, this hair oil is a great pick. Makes hair thick and lustrous: Another good point or plus I have experienced with this hair oil. With its herbal Ayurvedic ingredients like Bhringraj, Amla, Brahmi, Tulsi, the oil actually nourishes the scalp and the roots to make hair appear and feel thicker, darker, and shinier. While, my hair fall continues, at least the hair that are remaining on my scalp look healthier and thicker than before. And this makes me feel happy and hopeful because I had lost all faith that my hair will ever look good and healthy again. Too pricey! Now INR 999 for a hair oil is too high a price and everyone would think twice before spending the amount on a hair oil that comes in a plain plastic bottle! 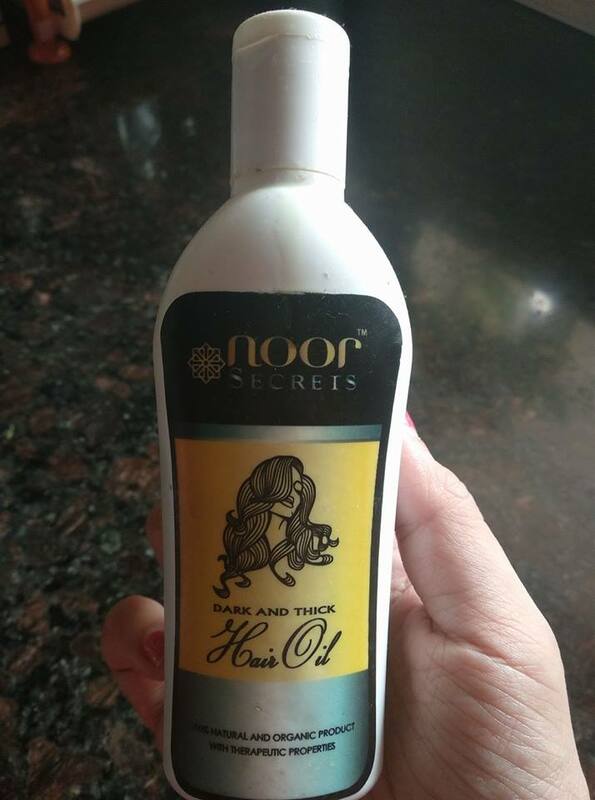 Final Take: Except the price point, Noor secrets is a wonderful hair oil full of natural herbal ingredients, all of which are amazingly good for the hair. 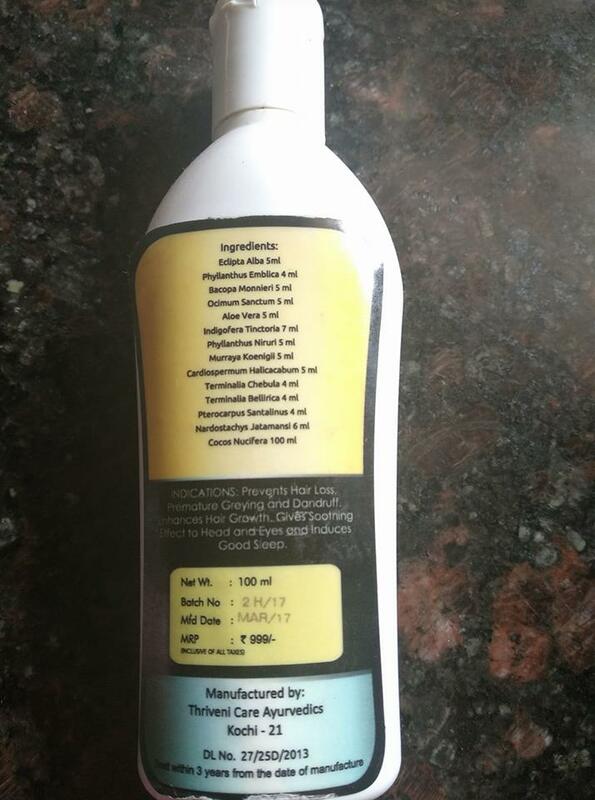 If you are not suffering from any severe hair fall related to some medical issue, do give this hair oil a try for seriously healthy looking, lustrous hair. Such a detailed review on the product. I am someone who goes through regular hair fall as well. Juicy Chemistry’s Lavender and Sage hair oil has helped me to slight extent.